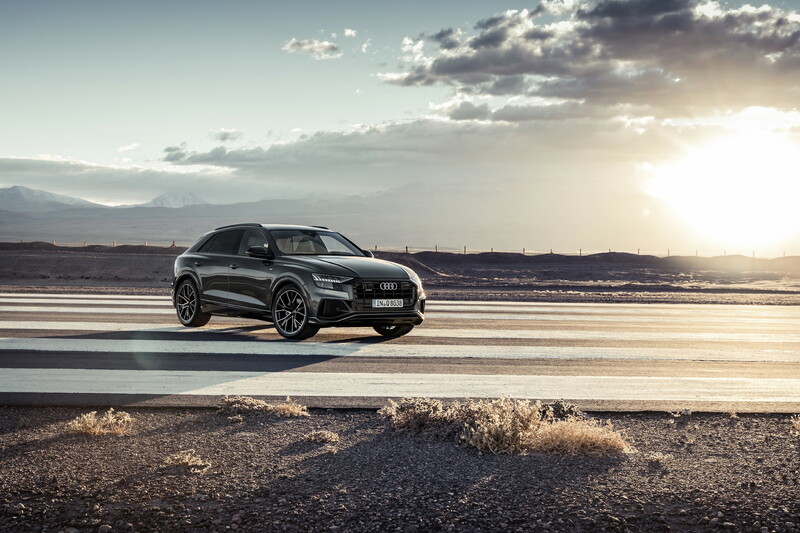 A stunning exterior announces the Audi Q8 as a blatantly indulgent treat. The big five seater is a large SUV that people will buy as a deliberate purchase. 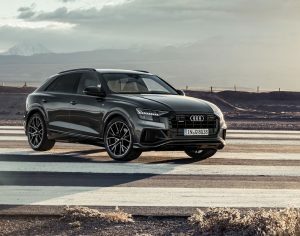 The flagship Q8 comes may come with a six figure price tag but it looks that bit more special than most full size 4X4s. 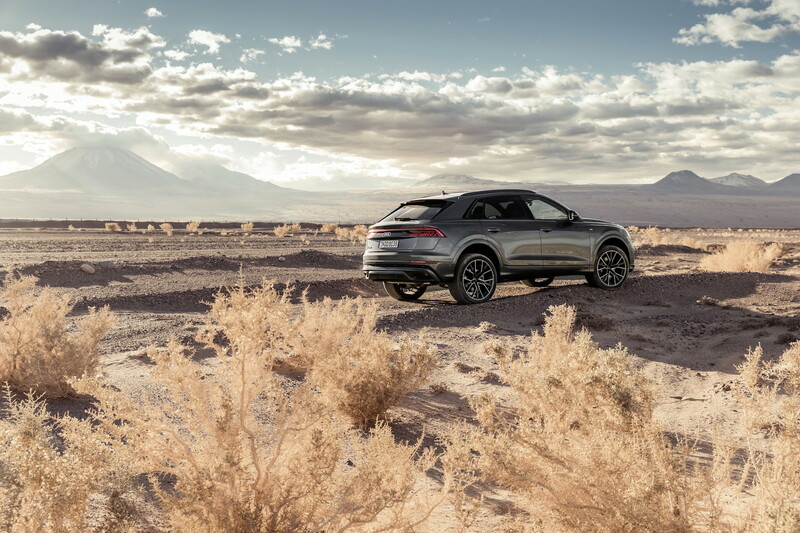 The Q8 is a sleek crossover that despite being built on the same underpinnings of nearly all VW group’s big barges Porsche Cayenne, Bentley Bentayga, VW Touareg etc. manages to disguise its bulk quite well. 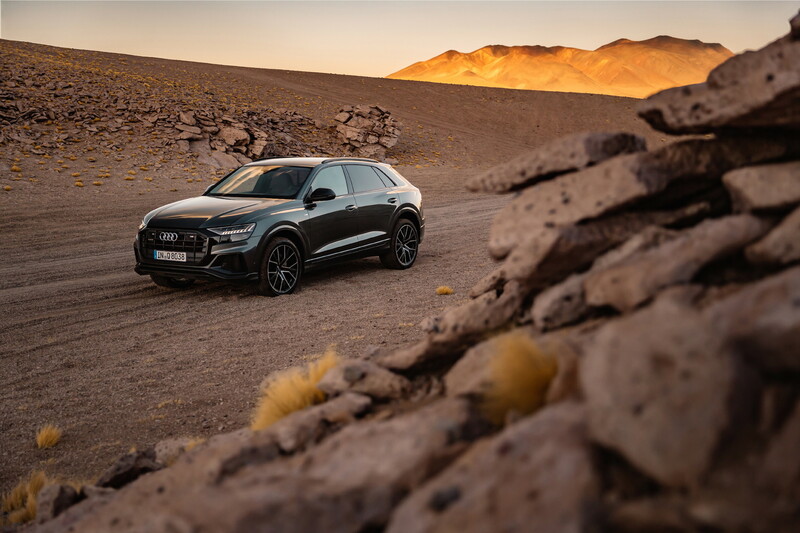 Don’t be fooled, the Q8 takes up a substantial chunk of the road but its presence is softened by an exterior design that looks more like a scaled-up hatch. 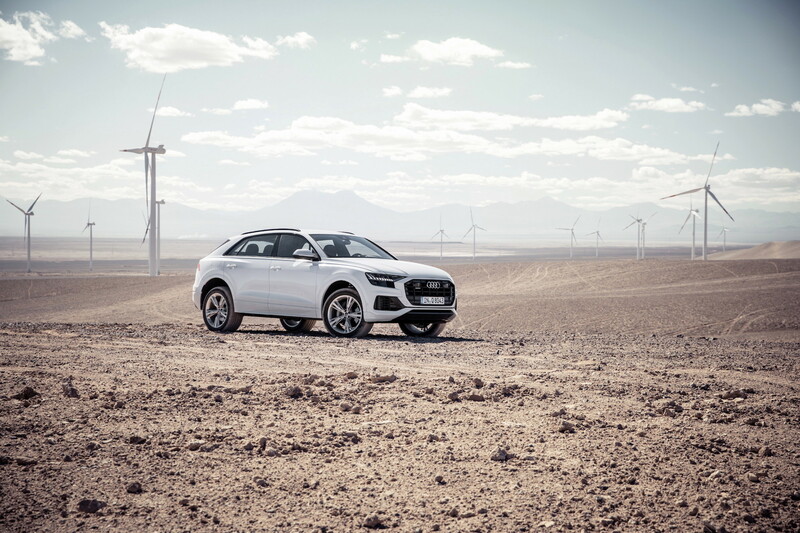 From a distance and viewed in isolation you’d swear the Q8 was a new Sportback of some sort. 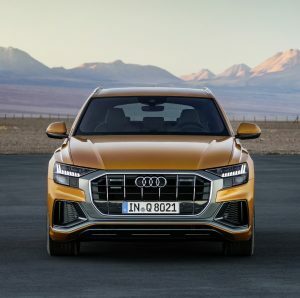 The exterior takes the current Audi design language to the max and the massive grille signals get out of my way in any rearview mirror (although compared to a BMW X7’s grille the Q8’s in quite neat!). The roofline is the key to the illusion of compactness. The tailgate is far from vertical and drops away to ultimately lose cargo space but deliver big on its design brief. Big alloys fill out the arches beautifully and a walk around the Q8 will reveal lots of styling treats that will help justify the price (a little bit anyway). 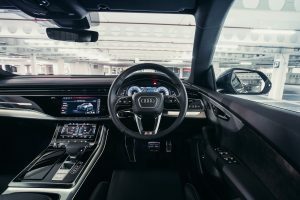 Inside the Q8 is a lesson in Audi’s current flush surfacing design language that is truly impressive. 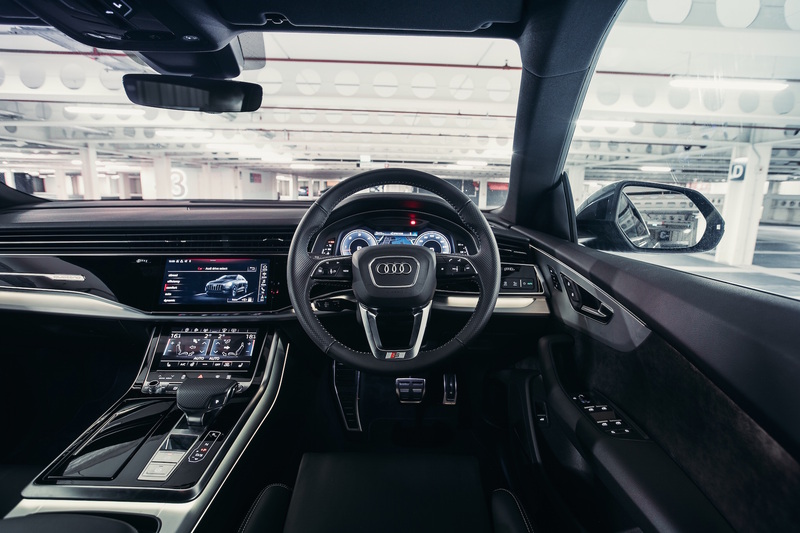 The A8, A7 and A6 all feature the same new layout and switchgear with touch screens galore. I’ve been in Audi’s new design HQ before they lock it down and the team there are wonderfully passionate about every aspect of premium styling. It is no surprise that its latest cabins are so desired by premium car buyers. Or test car was an S Line model with €24,444 worth of options fitted. My issue with Audi is that a ‘premium’ machine like this should have these things as standard like all wheel steering (€1,907), a head up display (€2,304) and panoramic roof (€2,597)… the list goes on and includes more mundane stuff too. 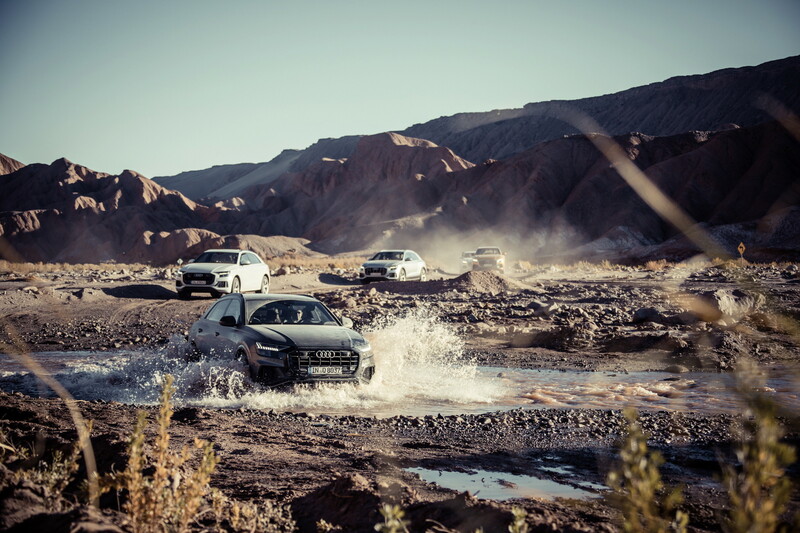 On the road the 50TDI Quattro we tested was great fun. The 48 volt mild hybrid, turbocharged six-cylinder 3.0 litre diesel simply adores motorway cruising and it automatic Tiptronic gearbox effortlessly delivers power to its quattro all wheel drive system. Power is sufficient without being outrageous at 286hp, it is a heavy machine but there is 600nm of torque and that’s a lot of pulling power. The dash from 0-100km/h takes 6.3 seconds and it is easy to drive with enthusiasm although you’ll pay a price for this at the filling station. 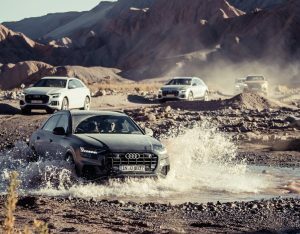 Scrubbing off speed reminds you of the car’s bulk but otherwise the Q8 will deliver all the performance you could need. The car, liek any good large car shrinks around you when behind the wheel and drives with surprising accuracy. 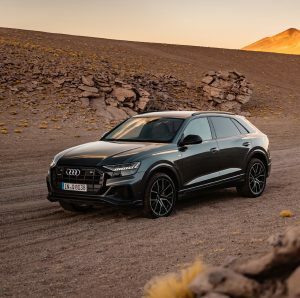 Ireland’s rural back roads are the only thorn in the side of relaxed motoring as the Q8’s imposing stance will take up all of its lane. 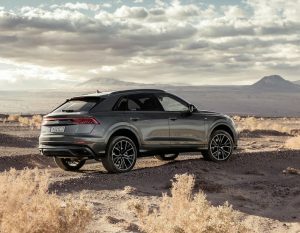 The Audi Q8 ticks a lot of boxes for buyers who want to be seen as independent thinkers who don’t need a seven seat Q7. The Q8 is a ‘just for me’ car that is a selfish purchase in the best sense of the phrase and a rewarding one too. Its very capable too on and off road. 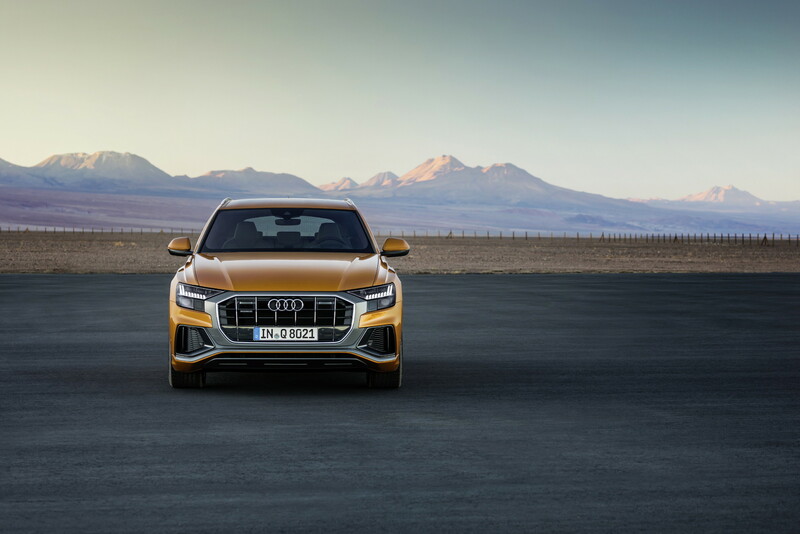 The Audi Q8 turns heads and is always a pleasure to walk up to. 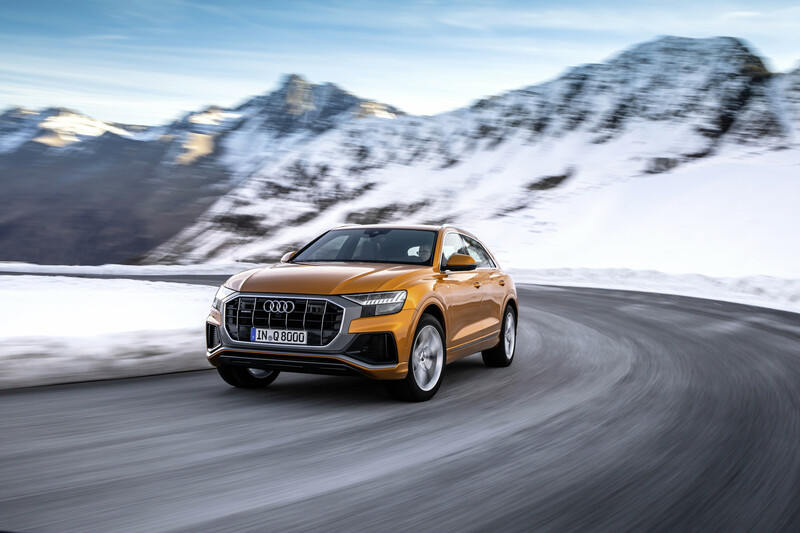 The on the road price in Ireland of the Audi Q8 S Line Tipronic is €104,520, our test Q8 cost a small car more at €124,644.